It’s debut is in Toledo in the spring of 1999. In Madrid has been represented in the “tablao” Los Canasteros” where an experienced and afflicting audience used to come and they received it extraordinarily. “Flamenco y Palabra” is a performance which the dance, the poetry and the flamenco music are interlaced. 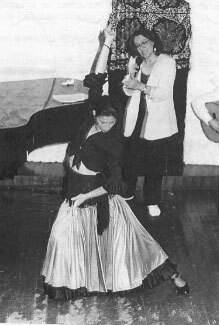 It’s objective is to bring the word for a flamenco expression, make it place instead the song and arrange it for the dance. In this work we can clearly received the poet’s voices that have been recited, they are: Rafael Alberti, Manuel Machado, Eduardo Blanco Amor, Antonio Machado, Miguel Hernandez, Federico Garcia Lorca y Manuel Benitez Carrasco.